Late Monday afternoon, we drove along Viale Gramsci on our way to the movie. Suddenly, something special happened. Slowing as traffic piled up at the light, we stopped directly behind a real live Woody Wagon. As you might imagine, from that point on, the day was no longer normal. 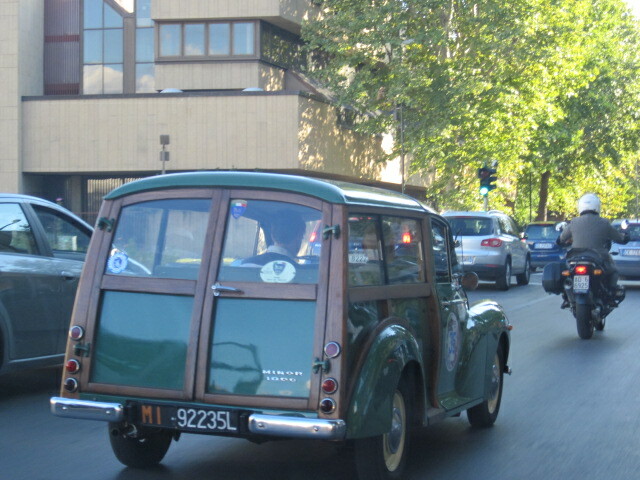 In Italy, I guess you might call the classic Woody Wagon: il carro di legno, wagon of wood, or perhaps even una macchina viaggiatore, a traveler’s car. In any case, you could definitely call it bella, beautiful— which translates no matter where you are in the world. 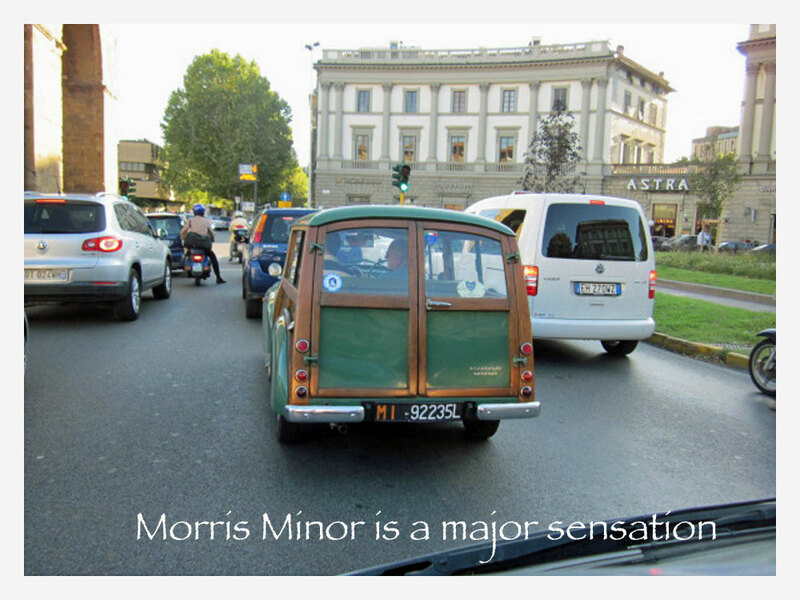 We were fortunate enough to be waiting in traffic behind a perfectly restored Morris Minor 1000 Woody Wagon Traveler, circa 1960. And what’s so special about that you might ask. It stood out like a bright, shiny wood beacon amid the dulling mass-produced sameness of its all-metal counterparts. That difference caused us to pay attention and take notice. There were hundreds of cars on the road that afternoon, and I couldn’t tell you one thing about any of them, except that they seemed to be either gray, white or black. There was nothing particularly noteworthy about any of them. That is, none except the Woody. We weren’t the only ones who zeroed in on that piece of automotive history. In a sea of metal, all eyes were tracking the wooden car. When the little underpowered forest green Morris appeared, we all were captivated. Maybe it was because of its immaculate condition; or that we were in the land of Fiats and Lancias, and that strange little British car really stood out; or that the steering wheel was on the opposite side; or that the two men riding in it with the windows down and their arms hanging out in the breeze seemed to be having the best time cruising around town. Most likely, though, it really was just because of the wood trim. From our perspective there’s something delightfully jarring about wood on a car, that fires the imagination. Of course, early coaches and carriages were always made of wood. Human transport was forever a wooden experience, not a steel thing. So naturally, when cars started to be made of metal, it was only logical that the tree should find its way back into the modern automotive vernacular. What could be better than a hand-crafted, brightly varnished, grainy piece of oak straight from the tree to provide warmth and imply a personal, hand-crafted touch. Woodies were so popular in the 30s, 40s, and 50s that manufacturers made several models. They were seen wherever cars motored along. That is, until after WWII when the entire world changed. Sadly, the Woody never really recovered with any staying power. They became relegated to musty barns, or on the beach with quirky surfers who didn’t really care how they looked. After all, nobody wanted to spend their time and money maintaining a wooden car when steel was such a slick, shiny, low maintenance alternative. So the Woodies started to disappear from the scene. Then, as is so often the case, they enjoyed a resurgence. People became fascinated with the unique qualities of those bygone styles and started a revival. Collectors’ Clubs popped up. 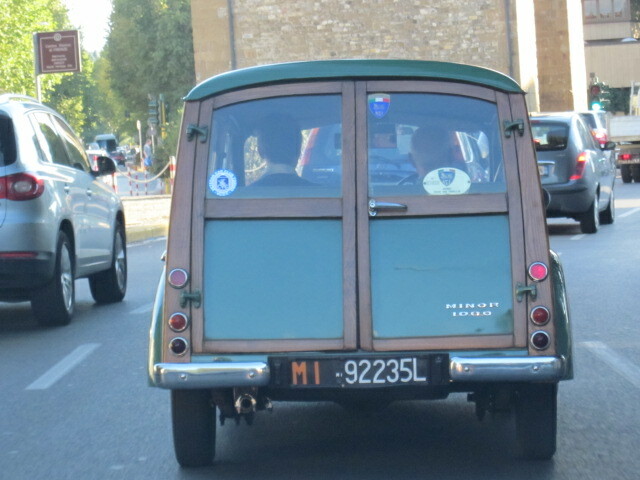 And thanks to their loving attention to detail, we were able to enjoy our own snippets of delight in that forest green Woody, on that sunny Monday afternoon on Florence’s Viale Gramsci. The one-of-a-kind can’t help but be noticed! I always wanted a wood paneled station wagon! This car is beautiful! What a treat.